One political irritant between the U.S. and Mexico over the years has been immigration policy – an issue that is currently before lawmakers on Capitol Hill. In 2010, Mexicans reacted negatively when Arizona Gov. Jan Brewer signed into law a controversial measure to crack down on illegal immigration, a measure that also caused heated debate in the U.S. Mexico’s then-President Felipe Calderon declared the law “an obstacle to the solution of the common problems of the border region and in North America as a whole.” The measure made failure to carry immigration documents a crime and empowered the police to detain anyone suspected of being in the U.S. illegally. Nearly two-thirds (65%) of Mexicans surveyed after the law’s enactment had heard about it, and the image of the U.S. in Mexico took a nosedive, according to a 2010 Pew Research Center survey. Prior to enactment of the law, 62% of Mexicans had a favorable view of their northern neighbor while only 27% held a negative one. After the measure became law, 48% of Mexicans registered a negative view of the U.S. while 44% expressed a positive one. The survey did not specifically ask if the law was the reason for the change in opinions. But positive views of the U.S. have bounced back since then. 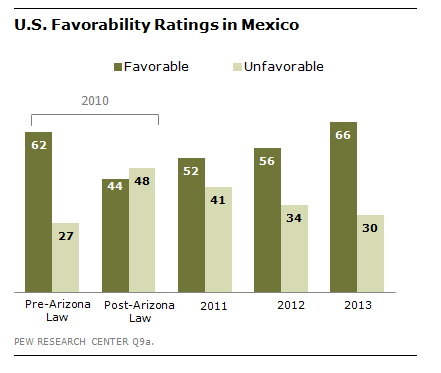 In a survey this spring, 66% of Mexicans said they viewed the U.S. favorably compared to 30% who did not. That represented a gain of 22 percentage points among Mexicans surveyed after the law’s passage in2010. Mexicans have strong personal connections with friends and relatives in the U.S. Although few Mexicans (17%) said they had ever traveled to the U.S., many are in frequent contact with people who live there. Of those who have a friend or relative living in another country whom they contact regularly, 85% cited the U.S. as a country where their friends or relatives reside. The Mexican public’s view of the immigrant experience is generally positive. Of those who know someone living in the U.S., seven-in-ten said their friends or relatives had achieved their goals, although 27% said they knew someone who had been deported or detained by the U.S. and three-in-ten knew someone who returned to Mexico because they could not find work.